What Education Do I Need To Work In Laboratory Science? Laboratory science professionals hold many types of degrees, from high school diplomas to doctorate-level degrees. Most employers require certification for laboratory professionals in clinical and anatomic pathology laboratories. Certification recognizes individuals who have met specific criteria predetermined by the certifying organization. In the U.S., some states require licensure in addition to certification. Like certification, licensure recognizes individuals who meet specific standards but are typically more stringent than those established by the federal government. Unlike certification, it is illegal to work without a license in a state that requires it. There are many pathways that lead to a career in the laboratory sciences. There are pathways for high school students, students already enrolled in college, and individuals who have a college degree. For careers where a bachelor’s degree is required, there are traditional 4-year programs, as well as “2+2” and “3+1” programs. In 2+2 programs, students complete 2 years of foundational prerequisite coursework followed by 2 years of coursework in their chosen laboratory science program. 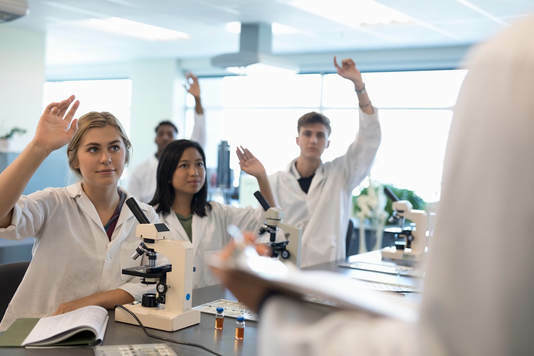 Similarly, in 3+1 programs, students complete 3 years of foundational prerequisite coursework followed by 1 year of coursework in their chosen laboratory science program. For students who already have a college degree, there are 1- and 2-year master’s programs available, as well as 1-year hospital- and university-based undergraduate programs. To find the right program for you, use the links below. NAACLS accredits programs for Phlebotomist, Medical Laboratory Assistant (Clinical Assistant), Medical Laboratory Technician, Medical Laboratory Scientist, Histotechnician, Histotechnologist, and Pathologists’ Assistant. CAAHEP accredits programs in Cytotechnology.